For the very first time, Showmasters organized a Collectormania event in Copenhagen. And René was one of the guests, together with Robert Englund, Bronson Pelletier, Jason Momoa, John Rhyes-Davies, Josh Herdman, Natalia Tena, and Mike Edmonds. Having planned a nice weekend in Denmark, I arrived in Copenhagen on Friday, and took a walk to see where the event would take place…I was quite surprised to find it set in a sad neighbourhood. The building itself was quite nice, it was a modern gymnasium that could welcome the guests, the dealers, and the expected crowd. On Saturday morning, we had a briefing at 7:30 a.m. and I discovered that I had been assigned to Robert Englund’s cash desk. I still wonder how they ended up choosing me as I had pretty much no knowledge of the Danish money, so just imagine the challenge it can be to work with a foreign currency. Robert and Bronson had been installed upstairs, meaning I had a nice view of the pool. René arrived early (the doors were to be open at 9:00 a.m. for early birds) and when I went to greet him, he seemed to expect me to help him with his drawings. Just take two seconds and imagine how bad I felt. Yes, at that very moment, I wished I could run to the closest wall and hit my head. Our attempt to get me to assist René failed, but the crew leaders promised I would be assisting him the next day, so it was kind of good news. Ironically, I couldn’t even go to listen to René’s talk as I was stuck at my desk selling pictures… But I still managed to run away at some point and “visit” René, who wasn’t very busy. 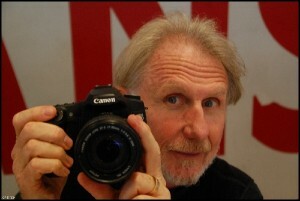 We exchanged a few comments on his new camera which he had with him. Sadly, the event wasn’t as crowded as expected. I was told that advertising the event was so expensive (but everything is awfully expensive in Denmark) that the team had to do a minimum of advertisement, resulting in very few people actually coming. But the interesting thing was that there were a lot of people dressed-up, and some costumes were really amazing. At 4:30 p.m., almost all the actors left, while the crew remained until 6:00 p.m., entertained by the local gang chasing one of the actors, dancing with Orcs, or simply tasting Danish pastry. The event started one hour later on Sunday–meaning you could have time to get some coffee to pretend to be awake–and the guests came to the tables around 11:00 a.m. I was sitting to René’s left, and to my own left was Sarah, who was assisting John Rhys-Davies, who has a talent to talk about basically everything. To the right, sitting next to René, was Mara, who was assisting Jason Momoa (a very tall and funny guy who had brought a book to read in case he had no queue) and next to them were Ditte and Natalia Tena (who is exceptionally dynamic). While everybody was hoping to have more visitors on Sunday, it was actually the other way round. There were so few people that the organisers even suggested closing the event at 2:00 p.m.
René, having a flight for Paris at 6:30 p.m. was a little concerned by this news. To kill time, Jason and René started exchanging pictures and drawings with little comments on them. René’s photo shoot was taking place at 11:50 a.m., and since I wasn’t supposed to assist him there, I thought I’d look around and see what the dealers’ stands were like. But finally, one of the British crew caught me and offered me to get a picture with René. Then, at 12:45 p.m., it was time for René’s talk. Again, I couldn’t hear all of it, but at least this time I managed to go. Of course, there were the usual questions, like “how long does it take to get Odo’s make up done?” but there was at least one story I hadn’t heard before. 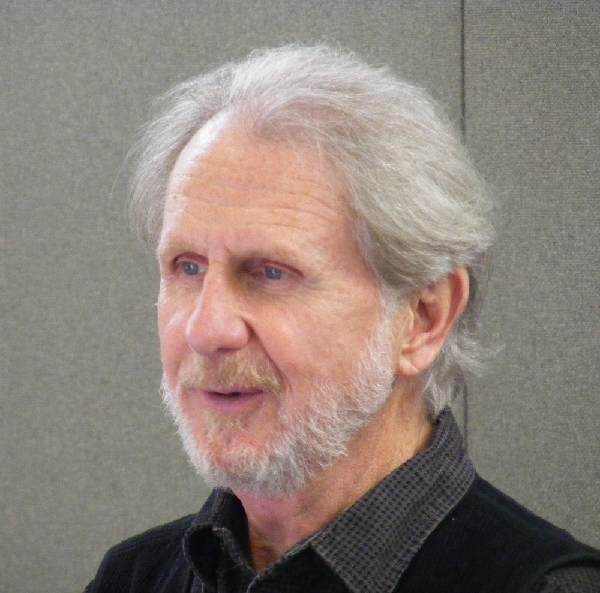 One question was about the way of filming Odo’s shapeshifting. René’s first answer was: “I hope you know I don’t do that for real,” before he explained that he would mimic the action, like, for example, a bird about to fly, until at a certain point he stopped, and then it would be up to the crew to film a real bird and/or use computers to “build” the shapeshifting scene. Also, he once suggested that Odo could shapeshift into Quark and pretend to be him. To this suggestion, Armin Shimerman answered: “Yes, so you wouldn’t have to work, I would!” On the same topic, for the DS9 episode where Odo shapeshifts into a German shepherd, René wasn’t needed to work, and when he came back, everybody congratulated him for his role as a German shepherd, claiming that he was very talented. The talk only lasted 30 minutes and then it was time for René to go for lunch. As a result, he missed the bullwhip show put on by some guys dressed as Indiana Jones. First, I have to say that I never saw so many Indiana Joneses. There were maybe four or five guys dressed as Indiana Jones, so the effect was a little weird. Second, when René asked me what had taken place, I had no choice but to mimic the action, because I had no idea how to say “bullwhip” in English. René kindly taught me the word and its spelling and also explained to me the goal of this action, since he used to know how to crack a whip in his youth. As the venue was pretty empty, some actors left quite early. René was one of the last ones to leave, at 4:30 p.m., asking if I would be there for Collectormania London and if I would be able to convince the crew to assist him with his drawings. Even if the event wasn’t very crowded, the fans who came to see the guests were all very happy as they had the opportunity to chat with the actors and also get pictures. As for myself, I left Copenhagen the next day, discovering that there was a big wind storm in Luxembourg that made the plane miss its first approach to the airport. Scary, but still, after we safely landed I felt ready for my next flight: London, for Collectormania London, five days later! I had a feeling that the London experience would be slightly different from the Copenhagen one. Well, it was. Instead of 6 guests, there were something like 60, so I won’t name them all, as I don’t even know them all. Among them were Shannen Doherty and Bryan Krause, David Soul, George Takei, Chase Masterson, and, the biggest attraction, John Barrowman. To go to Olympia where the venue was, I had a nice subway ride since I was staying at my usual Youth Hostellery near St. Paul’s, so I knew I had to get up early to be at the venue at 9:00 a.m. I went to Earls Court as the subway for Olympia doesn’t run very often. Earls Court is about 10 minutes by foot from Olympia and the walk even allowed me to indulge my passion for Starbucks… I arrived quite early (like 20 minutes before the opening) and realized that there was already a queue outside. People were basically running to get there before others. Impressive. At 9:00 a.m. sharp, the doors were opened and, when I finally got to enter, I found myself in a pretty big place, full of dealers’ stands and quite crowded. After checking on a map, I discovered that most of the guests were upstairs, because it was a two-floor event. Big, I told you. René was easy to find as he was in a corner, at end of the row (right under some kind of ventilation equipment). Next to him was sitting Chase Masterson, and next to her was George Takei. As usual for Collectormania events, they each had an assistant. My coming wasn’t a real surprise, though, as it had been agreed with the Collectormania organisers that I would be there as the “Charity Assistant” for René. This nickname soon changed to “René’s Angel” after a good laugh with the crewmember who was taking care of the queuing. By the time I found René’s position, there was already quite a queue forming at his desk. It was good to see there were more people coming to see him than in Copenhagen, but I was stuck behind everyone else, thinking that I was missing an opportunity to sell the drawings. So I began to talk about the charity, got some attention and boldly went forward to throw my stuff behind the desk and steal some blank paper from René. Sarah, his assistant for the day, was really patient with me because every time I needed something from my bag (“I need a handkerchief,” “I need to find a way to keep the money safe,” “I need to text my Mom to check on my cats,” etc. etc.) she would have to hand me the bag over the desk. My perfect answer was: “Hmm, because… I don’t know.” But René began to laugh, so I grinned and said: “Because he [meaning René] would be jealous.” “Oh yes,” said René, while Sarah was looking a bit surprised. I explained further, telling her that since I came to the convention to see him, he wouldn’t like seeing me assisting someone else. René confirmed again that this was true, and Sarah was really confused (and I pretended to go sell a drawing to hide my laughter). My task was really easy. 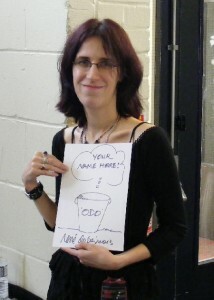 I would convince people to buy an Odo’s Bucket drawing and they would give me 10 pounds in exchange for an empty piece of paper on which René would do his drawing. Quite an organised system, right? So I would walk the queue, talk to people, and eventually they would buy the drawing. Every time I arrived at the end of the queue, I would chat with the Collectormania crew, and every time there was no queue, I would chat with René and Sarah (who kindly offered me a bottle of water as I feared I would soon get hoarse). There was really no time to rest, and that was actually good as I had nowhere to sit and rest, anyway. During lunch time, René stole Chase’s chair (she was away, so it was okay) and passed it over the desk so I could rest. That was very nice of him and a very good idea! I was under the impression that the afternoon would be terribly crowded and I was looking forward to a lot of people coming, but surprisingly enough, it was quiet. In fact, the afternoon was so quiet that I eventually joined Sarah and René behind the desk (and yes, I found a chair!). Between two conversations, René got the address for where he was supposed to go that evening, and because Sarah and I were a perfect team, I grabbed my map from my bag and Sarah explained to René how to get there. In the meantime, I gave him the money back and he started to nicely sort the notes until he wondered why he was doing this. Needless to say, Sarah, sitting next to us, was laughing. She laughed even more when René started to mimic my terrible French-accented English and then I fought back, singing “Les Poissons” with no English accent in the French parts. In the end, we found that we had raised a little over 300 pounds for charity on Saturday. René left at around 5:00 p.m., like the other guests. I remained a while with Sarah before going back to the youth hostellery to get a good night’s sleep…. I was up early again and took an early subway, then visited Starbucks again (the toffee nut latte is really addictive). I reached Olympia around 8:00 a.m. and I have to say, I just froze when I saw the queue outside. I never saw anything like this before. The doors weren’t going to be opened until 9:00 a.m. and people just kept on gathering. All this for John Barrowman, who was one of the guests for this day. Amazing. I saw a security guard at one of the doors and showed him my VIP pass. He let me enter immediately and closed the door shut behind me; I guess he didn’t want to risk any people trying to follow me. I made a mental note to thank René for the pass he had given me the day before, because it had just saved me from spending half of the morning in a John Barrowman fan queue! I reached René’s desk, where I met Donna, his assistant for the day. Like Sarah, she was very nice and we chatted until René arrived. In comparison to the day before, there weren’t that many people coming. But there was quite a crowd for John Barrowman, whose desk had been placed in the middle of the row. Maybe in the hope he would attract people and then they would go to see other actors, too? Not the smartest move, because the crowd kept expanding on all sides, sometimes even preventing people from coming to see the other guests. Eventually, the Collectormania crew had to figure out a way to get some order in this little chaos. At first, I tried to sell the Odo’s Bucket cartoons the same way I did the day before, but there were so few people that I ended sitting at the desk with Donna and René, trying to sell the drawing whenever René wouldn’t interfere. Now seriously, how can I do my job if the guy next to me is ruining everything by talking over my speech or teasing me about my accent? From time to time, I would pretend to be angry at him, tell him to keep quiet, or just sit back and let him explain the charity, pretending to be on strike. It proved to be a quite effective commercial trick: people were entertained and most of the time they would end up buying René’s drawing. This remark surprised both Donna and me, and we looked at the lady who spoke. She just pointed at a picture. Water was indeed falling from the sky! (Less poetically, water was dripping from the air conditioner overhead directly onto the table!) We quickly tried to move the endangered pictures and got René’s attention in the process, who wanted to know what was going on. After Donna explained to him, he decided that we should do something about it. Mary arrived and he explained that it was raining on us…and found the solution in the process: moving the table forward. At first, Chase Masterson’s table was supposed to move with us, but finally it was just René’s table. René claimed that since nobody was coming to him, he would come to the people. Actually, with this little reorganisation, it was easier to get “out” and move around. Chase also was satisfied because she would have more space to take pictures with the fans who came to see her. At 12:30 p.m., it was time for René’s photo shoot so I went for a walk. I wanted to find a nice picture of Odo that a lady had brought to René to be autographed. She had told us that she had bought it at a dealer stand, but couldn’t remember which one. When I finally found it, I told the guys that I would come back later with René. Then it was time for the Star Trek talk with Chase Masterson, George Takei, and René together, after which René went to the dealer stand. The two guys had already prepared a big Paul Lewiston picture for René to sign and offered him the Odo picture in exchange. As I was wondering why they trusted me when I told them I would come back with René, the two of them had a good laugh and told me they remembered me from Collectormania in Milton Keynes, when I also came with René to their stand. Then, suddenly, memory flashed back and I recognized the guys in an instant. In the afternoon, we had another visit from Carolin, who had brought cookies for René (and I believe it was ginger dark chocolate…I just remember it was something strong!). René had been smart and brought a book with him to pass the time. Every time he started reading, someone arrived, so Donna and I kept encouraging him to read to attract people. At one point, while Donna and I were chatting, René pretended to read, then took the opportunity to take a nap. When I turned to tell him that someone was coming, I saw he was asleep, and called his name, but he didn’t stir. A hand on his shoulder didn’t wake him, either, so I gently prodded his shoulder and called his name again, and then he woke up. Teasing me, René grumbled that I had smacked him, and that I should have just called him instead, because that would have been enough to wake him up. 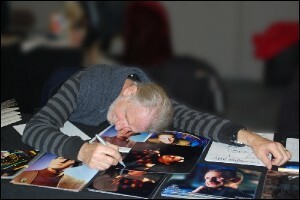 Since the venue was getting awfully quiet–except for the John Barrowman queue, which seemed endless–René staged the “One autograph too many” picture (and also came up with the title for it). While he was staging it, a concerned koala stopped by, wondering what had just happened to this poor exhausted actor. (It wasn’t a real koala; it was a girl wearing a koala outfit, who came back later to thank us all for being nice to the koala). One after the other, the actors were leaving, but René wasn’t expected to be at his evening engagement before 6:00 p.m., so he just stayed. Chase Masterson was already gone when I realized she had left a yellow stuffed puppy at her desk. Her assistant gave it to me because she wasn’t going to keep it and Donna and I named the puppy Odo and tried to decide what to do about him. At that point, René noticed that I had the puppy on my lap and asked about it, so we explained to him that this was Odo and that he was looking for a new home. Neither René nor I had space in our luggage to take him; therefore, Donna officially adopted Odo! Even though Sunday was a slow day compared to Saturday, we raised another 160 pounds, making the total for the weekend about 460 pounds. Bob is a very nice person, one of the Collectormania organisers who came to talk to René from time to time. René had the address where he was supposed to go that evening, so it was time to get the map out of my bag again. I was too slow. I had expected René to need it, but he just yelled “MAP!” and got a “COMING!” in answer. At that time, I was feeling a headache coming on. I couldn’t follow what Bob was saying any more and, since he has the kind of voice that has the effect of a lullaby on me, I thought I would rest my eyes for just one minute while the guys chatted, just to get rid of this headache and…. “Meme pas vrai!” [not even true] was my first, startled thought when I heard René’s amused voice–which indeed woke me up. Shame on me. Bob was still there and walked us out of the venue. René was up for taking the subway in spite of the rain. I didn’t care because I had a rain hood and felt very proud of it. Well, I was just the amateur there as René proudly showed me that he had an umbrella. René and I said goodbye at the subway station and it was time for me to go back to the youth hostellery to prepare for my flight back home the next morning.